How Does the Navy Enlisted Promotion System Work? The Army, Air Force, and Marines have "rank," to denote personnel in various paygrades. For example, a Senior Airman in the Air Force has the "rank" of Senior Airman and is in the paygrade of E-4. One addresses him/her as "Senior Airman," regardless of what his/her job actually is. In the Army, a Private First Class is the "rank" of a soldier in the paygrade of E-3. One addresses him/her as "Private First Class," regardless if his/her job is a plumber or an Air Traffic Control Specialist. The Navy doesn't have "rank." The term is "rate." The rate of an enlisted sailor can be determined by their rating badge, which is a combination of rate (pay grade, as indicated by stripes for E1-E3, chevrons for E4-E6, and an arch connecting the upper chevron for the eagle to perch upon for E-7, and the addition of one star for E-8 or two star for E-9 – the Master Chief Petty Officer of the Navy has three stars) and rating (occupational specialty, as indicated by the symbol just above the stripes or chevrons) on the left sleeve of most uniforms (utility uniforms have only rate indicated). For example, the "rate" of an E-6 in the Navy (i.e., what one calls him/her) depends on person's job. A person with the rate (job) of Sonar Technician, Surface (STG) in the Navy, in the paygrade of E-6 would be an "STG1," or "Sonar Technician First Class". An E-5 with the rate (job) of Culinary Specialist (CS), would have the rate of CS2, or "Culinary Specialist Second Class." However, things reverse in E-7 through E-9 paygrades – there the individual is identified first by their rate, then rating (job) – for example, a Boatswain’s Mate in the paygrade of E-7 would be a “Chief Boatswain’s Mate." Sailors in pay grades E-1 through E-3 are generally addressed as “Seaman” (last name), E-4 through E-6 can be addressed as "Petty Officer (name)". Chief Petty Officers are always referred to as "Chief", "Senior Chief", or "Master Chief" as appropriate. An example: "Chief Jones" or in subsequent references, just "Chief". General - considered apprenticeships, indicating eligibility for entry into various ratings. Though “Seaman” is used in the example, others are “Fireman” (FN) and “Airman” (AN). As with the other services, Congress tells the Navy how much enlisted personnel can be on active duty at any specific point in time, and the maximum percentages that can be serving in the pay grades above the grades of E-4. However, like the Marine Corps, the Navy has established their own limitation on the number of E-4s that can serve, so that pay grade is part of the "competitive" process. The Navy takes the number of "billets" they have for each enlisted rank, above the rank of E-3, and allocates them to the different ratings (enlisted jobs). In other words, the Storekeeper (SK) rating may be allowed to have 5,000 E-4s at any point in time and 2,000 E-5s and Hospital Corpsman (HM) rating may be authorized 7,000 E-4s, and 5,000 E-5s (as a general rule, the higher the paygrade, the fewer positions there are, within a specific rating). In order to promote someone (above the rank of E-3), there must be a "vacancy." For example, if an E-9 retires in a certain rating, that means that one E-8 can be promoted to E-9, and that opens an E-8 slot, so one E-7 can be promoted to E-8, and so-forth. If 200 E-5s get out of the Navy in a particular rating, then 200 E-4s can be promoted to E-5. Like the other services, the Navy has programs that will grant advanced paygrade (up to E-3) when joining up, for certain accomplishments, such as college credits, or participation in JROTC. Additionally, the Navy will give accelerated advancement (up to E-4) to recruits who enlist in certain enlistment programs, such as the Nuclear Field Program. For a quick overview of the Navy Enlisted Promotion Requirements, see our Navy Enlisted Promotion Chart. Also like the other services, promotions in the Navy to E-2 and E-3 are pretty much automatic, Time-in-Rate (TIR) [TIR is the date from which the member’s total service in paygrade is considered to have commenced for the purposes of advancing to the next higher paygrade], assuming that the individual does his/her job and stays out of trouble. • E-1 to E-2 - Nine months TIR. • E-2 to E-3 - Nine months TIR. No exam is required for advancement to E-2. However, commands have the option of administering E-3 Apprenticeship Exams for some ratings. Apprenticeship examinations consist of 150 questions. 100 questions are on the specific apprenticeship (job) and 50 questions are on general military subjects. Even so, promotions to E-3 are not competitive. The exams are pass/fail. Those who achieve a passing score can be promoted, those who don't receive a passing score will have to try again. Promotions to the rates of Petty Officer Third Class (E-4) through Chief Petty Officer (E-7) are competitive. This means that personnel within each rating (job) compete with each other for a limited number of promotion vacancies. Advancement exams for E7 are scheduled to be conducted annually on the third Thursday of January. The Commanding Officer (CO) / Officer In charge (OIC) recommendation is the most important advancement eligibility requirement, and the sole source for that recommendation is the member’s most recent evaluation report. This recommendation, however, can be withheld or withdrawn, should circumstances warrant (a CO’s mast, for example). Additionally, for promotion to the grade of E-4, Seamen (E-3s) must first be “rated”, either by having successfully graduated from the "A-School" (job school) applicable to their rating (job), or by becoming a “designated striker“; having significant skills gained on-the-job training (OJT) experience, coupled with rate change authorization from Naval Education and Training Professional Development and Technology Center (NETPDTC). Before an E-3 can be advanced to E-4, they must complete the Petty Officer Indoctrination Course. For promotion to E-6, Petty Officer Second Class's (E-5s) must first complete the P02 Leadership Training Course Continuum. For promotion to E-6, eligible E-6s must complete the P01 Leadership Training Course Continuum. Before an E-6 can be frocked or advanced to E-7, they must first complete the Chief Petty Officer Indoctrination Course. Candidates for E-5 & E-6 may be eligible for a 12-month waiver of TIR in some circumstances, but such a waiver is good only for the exam they are currently taking. So, once all of the above criteria are met, how does the Navy decide who gets promoted? The Navy uses promotion points that they call "Final Multiple Score" (FMS) system, which considers the whole person by calculating a candidate's performance, experience, and knowledge into the individual's final multiple score. Performance is shown in a person's day-to-day performance, work ethic, achievements, and so forth, and is documented in his or her performance evaluations. Experience is indicated by elements such as Time in Service (TIS) and Time In Rate (TIR)). Knowledge is reflected as examination performance. Candidates may also earn PNA (passed but not advanced) Points that are calculated into the FMS. PNA points are awarded to candidates who passed the exam in previous years but were not advanced, and in some cases, for a relatively high-performance mark average (PMA). In Navy Administrative Message (NAVADMIN) 114/14, the Navy announced significant changes to the current advancement policy, including a new formula for the Final Multiple Score (FMS) that took effect for the Fall 2014 advancement cycle. Promotion Test - Chief Petty Officers (E-7 to E-9) from each Navy rating develop advancement examinations. The examinations consist of 200 questions. Generally, about one-half of the questions are about general Navy subjects, and the other half covers the specific rating (job). The maximum possible score is 80. For promotions to E-4 and E-5, the promotion test comprises 45 percent of the total possible promotion points. For promotions to E-6, the test comprises 35 percent. For E-7s, the test comprises 60 percent of the total possible promotion points. Performance Evaluations - Sailors are rated periodically on their duty, conduct, and performance, by their supervisor(s) using written performance evaluations. The maximum possible performance evaluation points for promotion to E-4 and E-5 are 64, which means the points comprise 36 percent of the total possible promotion points. The maximum possible performance evaluation points for promotion to E-6 are 114, which means evaluations count as 50 percent of the maximum possible score. The maximum possible performance evaluation points for promotions to E-7 are 120, which means this portion comprises 60 percent of the maximum possible points. Time in Rate (TIR) (also referred to as Service in Paygrade [SIPG]) – These points are calculated based on years, and percentages of years completed since the last change in rate. For example, if a sailor has 3 years, 6 months TIG, that would be 3.5. Points are calculated as SPIG divide by 4 - E-4/E5 are allowed a maximum of 2 points, and E-6 allowed a maximum of 3 points. TIR Points are not used for E-7 promotions. TIR Points comprise only 1 percent of the total possible promotion points for promotions to E-4, E-5, and E-6. 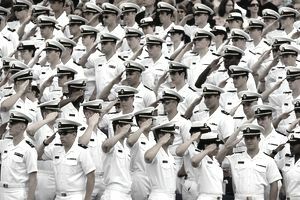 Passed, Not Advanced (PNA) Points - If a sailor was considered for promotion in the past five years, had high promotion scores, and high-performance ratings, but was not promoted because of a shortage of promotion vacancies, they get a "boost" in their promotion chances by the award of PNA Points. Only factors (promotion test scores and performance ratings) in the previous five promotion cycles can be used. In the changes introduced in NAVADMIN 114/14, PNA points are now only awarded to the top 25 percent of Sailors not advanced. Under the new policy, 1.5 PNA points go to the top 25 percent of Sailors by test and 1.5 to the top 25 percent by performance mark average. Total PNA points are determined from a Sailor's last five advancement cycles, capping at a maximum of 15 possible points. Sailors will keep PNA points they have already earned prior to the release of the policy change. PNA points are not used for E-7 promotions. For promotions to E-4 through E-6, the PNA points are listed on the profile sheet of the previous examination. A maximum of 15 points applies to E4 / E-5 / E-6 candidates, comprising 9 percent of the total for E4 / E5 candidates, and 6 percent for E-6. FMS results for all candidates are rank-ordered from the top to the bottom score - or from the most qualified to the least qualified. For example, there are 500 candidates for BM3 who meet all eligibility criteria for a given advancement cycle. However, there are only 400 vacancies to be filled. The rank-ordering process identifies the top 400 (based on FMS) who will actually be advanced. Special Notes: The previous change to the advancement calculations was in the NAVADMIN 183/07 affected those members testing for E4 to E6 – the changes it instituted were that the weight of the Performance Mark Average (PMA) from a sailor’s evaluation promotion recommendation was increased by 7 percent with the gradation increased from 12 to 16 points between an Early Promote and a Promotable recommendation. The weightings of Service in Paygrade (SIPG) and Pass Not Advanced (PNA) points were decreased by approximately one-half – placing more emphasis on the member’s performance and current knowledge, and less on their “laurels” of previous scores & longevity. As well, in the changes introduced in NAVADMIN 114/14, the weighting of SIPG was further reduced by a factor of only one percent of the final multiple score. E-4 selectees can be frocked upon receipt of the Enlisted Status Verification Report/Routing Change Authorization and after completing the Petty Officer Indoctrination Course; E-5/6 selectees upon notification of selection from Naval Education and Training Professional Development and Technology Center (NETPDTC), E-7 selectees no earlier than the first advancement increment and after completing the Chief Petty Officer Indoctrination Course; and E-8/9 selectees can be frocked upon receipt of official selection board results via NAVADMIN message. Chief Petty Officer (E-7) Promotions. The advancement exam is just the first step for those under consideration for promotion to E-7, Chief Petty Officer. Within each rating, those in the top 60 percent (based on the above promotion points) are considered for promotion by a service-wide promotion board. It’s the promotion board who actually decides who gets promoted to E-7 and who does not, within each rating (job). Navy-wide Promotion Boards are used for promotion to Chief Petty Officer (E-7), Senior Chief Petty Officer (E-8) and Master Chief Petty Officer (E-9). Those that are qualified for selection board consideration are considered “Selection Board Eligible” (SBE). E-7 candidates are designated SBE by completing the advancement exam and meeting the final multiple requirements for their rate; E-8 & E-9 are designated SBE on the basis of their CO / OIC Advancement recommendation. Each selection board consists of a captain (O-6) who serves as president, a junior officer from BUPERS advancement section, who serves as a recorder, and officers and master chief petty officers who serve as board members. Additionally, a sufficient number of assistant recorders ensure the smooth handling of records. The exact size of a board varies, but each board usually consists of about 78 members. The board meets in Washington, D.C., and officer board members are generally drawn from the D.C. area. The enlisted members are usually from out of town. The recorder, assistant recorders, officer of the Chief of Naval Personnel (CNP) enlisted advancement planner and Master Chief Petty Officer of the Navy may consult with the entire board on any matter concerning selections. With the board president's concurrence, the recorder divides the board members into panels, which are responsible for reviewing the records of individuals in one general professional area, i.e., deck, engineering, medical/dental, etc. Each panel consists of at least one officer and one master chief. A maximum select quota for each rating is established by BUPERS planners and is provided to the board. This quota is filled by the "best-qualified" candidates. Quotas may not be exceeded but may remain unfilled if the panel determines there is an insufficient number of best-qualified candidates in a rating. The Chief of Naval Personnel (CHNAVPERS) convenes the selection board annually. Each year an instruction, called a precept, is prepared for the board. It outlines the selection process and gives general guidance to the board regarding such selection criteria as equal opportunity considerations. The precept varies only slightly from year to year. An oath administered to board members and recorders on convening is contained in the precept. The precept also outlines the expected conduct and performance of persons serving on the board. Upon convening, the board establishes internal ground rules and minimum selection criteria, which each member uses when screening the records of candidates. The rules/selection criteria are applied equally to each candidate within a rating. The application may vary slightly from rating to rating for many reasons, such as sea duty or lack of it, supervisory opportunities, schooling availability, rotation patterns, etc. The board is given the freedom to establish its own internal procedures, within the guidelines of the precept, thereby providing for the dynamic nature of the selection process. Professional Performance at Sea. While it is not necessary that a candidate is serving in a sea duty billet when the board convenes, it is desired that his or her record reflect demonstrated evidence of professional and managerial excellence aboard at sea or at isolated duty assignments. Education. This includes academic and vocational training, whether such education is gained as a result of the individual's initiative during off-duty hours or as a participant in a Navy-sponsored program. Evaluations. Evaluation marks and narratives are closely reviewed and a trend is identified. The single-most important factor influencing selection is sustained superior performance. The summary ranking also gives the board an indication of how the candidate compares against members of the same pay grade at his or her command. Personal decorations, letters of commendation or appreciation, etc., are given consideration. Command and community involvement also reflect a well-rounded, career-motivated individual. Duty Assignment History. Assignments and history of duties performed are determined from the service record transfers and receipts page, and the job description on the evaluations. This data shows board members whether or not the individual is performing duties commensurate with his or her rate and if expectations of professional growth are being met. Standards. Failure to meet the Navy's physical readiness test and percent body fat standards can hinder an individual's selection opportunity. Individuals who have had disciplinary problems, received a letter of indebtedness or have other record entries relevant to behavioral difficulties such as drug abuse or have demonstrated racial, sexual or religious discrimination, will find the path to E-7/8/9 more difficult than those with clear records. Test Scores. (E-7 only) - Scores for E-7 candidates are also taken into account since they give the individual's relative standing on the examination compared to other candidates. In some cases, commanders have the authority to bypass the normal promotion system and promote sailors early. For example, outstanding recruits are often given a meritorious promotion in boot camp, and/or “A School” (job training). It's also customary to meritoriously promote the command winners of the Navy's Outstanding Sailor of the Year Program, and the Navy Recruiter of the Year Program. Other special promotions are the Selective Conversion and Reenlistment (SCORE) Program, and Selective Traning and Reenlistment (STAR) Program. Note: This article was substantially updated in May 2014 by Patrick Long, incorporating several significant Navy enlisted promotion system changes announced by Navy Administrative Message (NAVADMIN) 114/14. What Is the High Year of Tenure in the US Military?